Super Recommended! Charming and funny. If you like Gintama, give this anime a try. The characters are really charming and funny. The episodes are split into small stories which make them easy to watch. If you are learning Japanese or are familiar with it, the writing is also quite clever and easy to understand. I love the art style of the anime as well. Can't wait for more! Very Funny Hope the rest of the show stays as good as the first episode. I thought this show was very funny and i really liked the characters and the story. I liked this anime humor and the main character was also one who i could see myself really liking as the story progressed. I thought the first episode was very interesting and i look forward to seeing how the show continues. For a slice of life anime this is the most interesting you will probably ever see. The sliced life in this series is that of Japanese Hell's highly efficient and somewhat sadistic head manager. Silly and rather simplistic but also breathtakingly beautiful because it's drawn like a huge, colorful woodblock print. There are many anime out there in regard to hell and heaven, but rarely do we see a casual side of both world living in "harmony" with one and another, serving as important aspect of a functioning world. Hell, which in many literature played the role of every tormenting destination for those that have sinned, which is what the hell in this anime has displayed, but the difference apart from the other hell of other literature, this hell displayed in this anime provides an significant explanation of "why hell has an important role and how it function." Kind of like your educational tv program with heavy cultural reference to Japan mythology. In regard to plot, every episode is kind of a mini story of its own, so you don't necessarily have to start from the beginning to understand the story, but you do need however a competent understanding of Japanese traditional and modern knowledge. The plot is filled with also some parodies of somewhat serious topics of controversies which makes a difficult subject much easier to enjoy and relate to. The anime art style is filled with traditional drawing which is a fresh look for the current season of anime while still maintaining an "up to date" character styles. The opening of this anime is quite catching which is always a good build up for excitement for the anime, but aside from that, I can't say the BGM is any more than average, though it does fit the theme of the anime quite well. Overall, I give this anime a 4/5 for an interesting look on a generic subject of hell while having a intriguing spin off of the original concept. I would give this anime 5/5 if it wasn't for the heavy Japanese culture/Chinese culture requirement in order for this anime to be enjoyed fully. The anime really test your knowledge of Japanese Chinese culture. The humor here rely heavily on contradiction of the action and the situation at hand, so there will be at time you are both laughing and scared at the same time. It is Hell after all. Entertaining office comedy... In hell. I've been mourning the dearth of anime for folks who are out of shool... This fills that gap. The characters are fun and the plots are goofy, the animation is brilliantly done and quite weird. I love the strong traditional japanese elements mixed with modern clture. It's pretty much perfect all around; I wish I knew how to write to the anime studio and let them know that even people on the other side of the planet really like it. if youre reading this, watch an episode! i have never written a review on here before but i felt like i should just for this show. i honestly don't think CR has the right category for it first of all; it's more like a slice-of-life comedy that just happens to take place in hell than any kind of fantasy or adventure. the art is gorgeous, the music is great, the voice acting is top notch and it makes me laugh out loud constantly, which is not something almost any other contemporary anime does. there are a LOT of references to japanese art, history, literature, etc.. as well as japanese wordplay so a large portion of the jokes just go straight over my head as i think they will with most western viewers, but it's still hilarious despite that and super enjoyable. this show is actually one of the few reasons that i pay for crunchyroll: it looks excellent in 1080p and i usually watch new episodes the day they come out, something i've never done in the past for any series. tl;dr - it's worth watching, give it a try if you're interested at all. 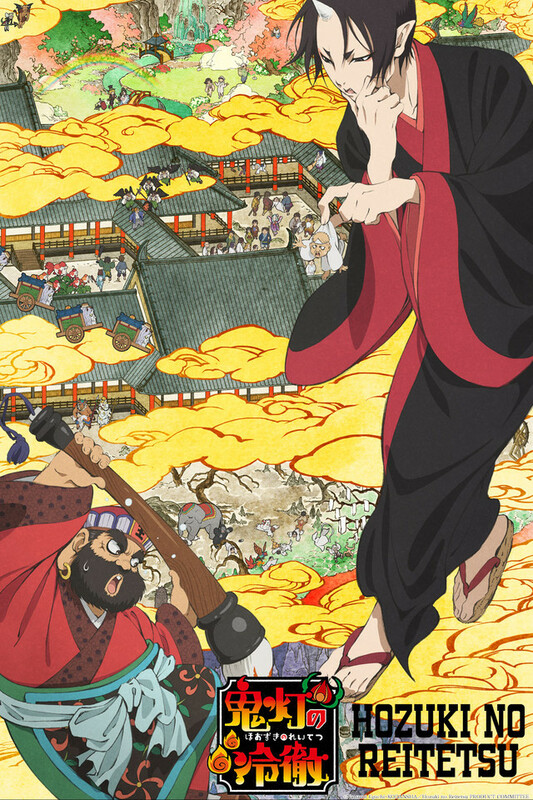 it does help to have some knowledge of old school anime and japanese folktales, but really, it's worth the view just for the art and perfect flat delivery from the lead character, never fails to make me crack a smile. like a japanese version of the Office, but set in Hell. Often I don't get Anime comedies unless they are off the wall weird or awkward and thankfully this is both! You'll probably need to know some of the japanese legends/ folktales that come up in the episodes to get the full jist of some of the jokes. But there's plenty to laugh at even without that knowledge. Favorite quotes so far: "Please this is hell. Let's solve it with violence." and "I can't figure out the Japanese brain!"